Harmful bacteria will grow rapidly if chilled food is not kept at the correct temperature. Our range of fridge thermometers including bimetal strip, spirit and digital instruments can help to ensure that food is stored safely. The fridge thermometer is also sometimes referred to as a chiller thermometer, coldroom thermometer or refrigerator thermometer. Harmful bacteria will grow rapidly if chilled food is not kept at the correct temperature. We offer a large range of thermometers designed for fridges (refrigerators), freezers, chillers, cold rooms and larders which will help to ensure food is kept out of the "danger zone". Our thermometers include colour-change, spirit-filled, bimetal strip and digital instruments. The traditional fridge thermometer is now filled with spirit rather than mercury, which has now been banned for all but laboratory use. They are available in a number of styles but all clearly show the correct storage temperatures for fridges and freezers. 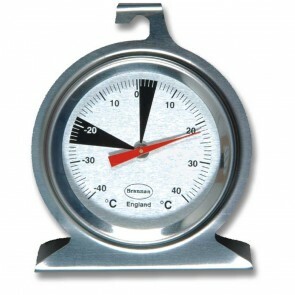 A dial thermometer relies on a bimetal strip to move the needle to the correct temperature. This strip is wrapped into a coil with one end of it being attached to the thermometer casing and the other attached pointer. The strip is actually made from two separate strips of different metals, usually steel and copper. These metals will expand at different rates as they are heated with the metal that expands most on the outer side of the coil. As the strip warms up the metal will bend in one direction and in the other direction when it cools. Although our dial thermometers are available in different casing, plastic, stainless steel etc the technology behind them is the same. The Thermometer Superstore range of fridge freezer thermometers also includes digital instruments. The sensor for the thermometer is placed inside the fridge or freezer and the digital display is left outside. This way the user can check the internal temperature of the fridge/freezer with having to open the door (and let in warm air). A digital thermometer will not only provide accuracy but many have additional features such as recording the maximum and minimum temperatures which gives reassurance that the appliance has been operating correctly over a period of time and alarms which will warn when the temperatures goes above a pre-set maximum.